a. Continued as Queen of Great Britain until her death in 1714. 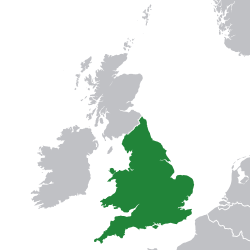 The Kingdom of England i/ˈɪŋɡlənd/ was a state on the island of Great Britain from the 10th century, when it emerged following the unification of various Anglo-Saxon kingdoms, until 1707, when it united with Scotland to form a unified Kingdom of Great Britain. The Anglo-Saxon kingdoms were unified under Æthelstan (r. 927–939) during the 10th century. 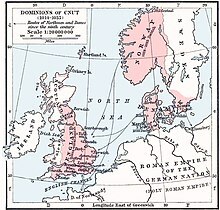 In the early 11th century, England became part of the "North Sea Empire" of Cnut the Great. With the Norman conquest, the kingdom became one of the territories ruled by the House of Anjou. The English capital and chief royal residence in the Anglo-Saxon period was Winchester, but Westminster and Gloucester were accorded almost equal status, with Westminster gradually gaining preference and becoming the administrative capital by the beginning of the 12th century. During the 10th century, the City of London quickly established itself as England's largest town and principal commercial centre. The history of the kingdom of England from the Norman conquest of 1066 is conventionally divided into periods named after the ruling dynasty as follows: Norman 1066–1154, Plantagenet 1216–1485, Tudor 1485–1603 and Stuart 1603–1714 (interrupted by the Interregnum of 1649–1660). Dynastically, all English monarchs after 1066 ultimately claim descent from the Angevins; the distinction of the Plantagenets is merely conventional, beginning with Henry III as from that time, the Angevin kings became "more English in nature"; the houses of Lancaster and York are both Plantagenet cadet branches, the Tudor dynasty claimed descent from Edward III via John Beaufort and James VI and I of the House of Stuart claimed descent from Henry VII via Margaret Tudor. The completion of the conquest of Wales by Edward I (formalised with the Statute of Rhuddlan in 1284) put Wales under the control of the English crown. Edward III (r. 1327–1377) transformed the Kingdom of England into one of the most formidable military powers in Europe; his reign also saw vital developments in legislation and government—in particular the evolution of the English parliament. From the 1340s, the kings of England also laid claim to the crown of France, but after the Hundred Years' War and from the outbreak of the Wars of the Roses (1455), the English were no longer in any position to pursue their claim and lost all their land on the continent, except for Calais. After the turmoils of the War of the Roses, the Tudor dynasty ruled during the English Renaissance and again extended their power beyond England proper, achieving the full union of England and the Principality of Wales in 1542. Henry VIII oversaw the English Reformation, and his daughter Elizabeth I (r. 1558–1603) settled the religious dispute, established England as a great power and laid the foundations of the British Empire by claiming possessions in the New World. From the accession of James I in 1603, England was ruled in personal union with Scotland and Ireland by the Stuart dynasty. Under the Stuarts, the kingdom was plunged into civil war, which culminated in the execution of Charles I (1649). The monarchy was restored in 1660, but the civil war established the precedent that an English monarch cannot govern without the consent of Parliament, although this concept was legally established only as part of the Glorious Revolution of 1688. From this time the kingdom of England, as well as its successor state the United Kingdom, was in effect a constitutional monarchy. [nb 4] On 1 May 1707, under the terms of the Acts of Union 1707, the kingdoms of England and Scotland united to form Great Britain. The Anglo-Saxons referred to themselves as the Engle or the Angelcynn, originally names of the Angles. They called their land Engla land, meaning "land of the English", by Æthelweard Latinized Anglia, from an original Anglia vetus, the purported homeland of the Angles (called Angulus by Bede). The name Engla land became England by haplology during Middle English period (Engle-land, Engelond). The Latin name was Anglia or Anglorum terra, the Old French and Anglo-Norman one Angleterre. By the 14th century, England was also used in reference to the entire island of Great Britain. 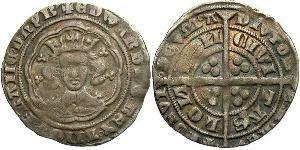 The standard title for all monarchs from Æthelstan until the time of King John was Rex Anglorum ("King of the English"). Canute the Great, a Dane, was the first king to call himself "King of England". 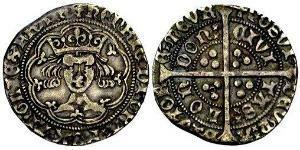 In the Norman period Rex Anglorum remained standard, with occasional use of Rex Anglie ("King of England"). The Empress Matilda styled herself Domina Anglorum ("Lady of the English"). From the time of King John onwards all other titles were eschewed in favour of Rex or Regina Anglie. In 1604 James I, who had inherited the English throne the previous year, adopted the title (now usually rendered in English rather than Latin) King of Great Britain. The English and Scottish parliaments, however, did not recognise this title until the Acts of Union of 1707. The kingdom of England emerged from the gradual unification of the early medieval Anglo-Saxon kingdoms known as the Heptarchy: East Anglia, Mercia, Northumbria, Kent, Essex, Sussex, and Wessex. The Viking invasions of the 9th century upset the balance of power between the English kingdoms, and native Anglo-Saxon life in general. The English lands were unified in the 10th century in a reconquest completed by King Æthelstan in 927. During the Heptarchy, the most powerful king among the Anglo-Saxon kingdoms might become acknowledged as Bretwalda, a high king over the other kings. The decline of Mercia allowed Wessex to become more powerful. It absorbed the kingdoms of Kent and Sussex in 825. The kings of Wessex became increasingly dominant over the other kingdoms of England during the 9th century. In 827, Northumbria submitted to Egbert of Wessex at Dore. Thus Egbert briefly became the first king to reign over a united England. England has remained in political unity ever since. During the reign of Æthelred the Unready (978–1016), a new wave of Danish invasions was orchestrated by Sweyn I of Denmark, culminating after a quarter-century of warfare in the Danish conquest of England in 1013. But Sweyn died on 2 February 1014, and Æthelred was restored to the throne. In 1015, Sweyn's son Cnut the Great launched a new invasion. The ensuing war ended with an agreement in 1016 between Canute and Æthelred's successor, Edmund Ironside, to divide England between them, but Edmund's death on 30 November of that year left England united under Danish rule. This continued for 26 years until the death of Harthacnut in June 1042. He was the son of Canute and Emma of Normandy (the widow of Æthelred the Unready) and had no heirs of his own; he was succeeded by his half-brother, Æthelred's son, Edward the Confessor. The Kingdom of England was once again independent. In 1092, William II led an invasion of Strathclyde, a Celtic kingdom in what is now southwest Scotland and Cumbria. In doing so, he annexed what is now the county of Cumbria to England; this final annexation established what would become the traditional borders of England, which have remained largely unchanged since then (except for occasional and temporary changes). In 1124, Henry I ceded what is now southeast Scotland (called Lothian) to the Kingdom of Scotland, in return for the King of Scotland's loyalty. This area of land had been English since its foundation in 927 AD, and before that had been a part of the Anglian Kingdom of Northumbria. Lothian contained what later became the Scottish capital, Edinburgh. This arrangement was later finalised in 1237 by the Treaty of York. The Duchy of Aquitaine came into personal union with the Kingdom of England upon the accession of Henry II, who had married Eleanor, Duchess of Aquitaine. The Kingdom of England and the Duchy of Normandy remained in personal union until 1204. John Lackland, Henry II's son and fifth-generation descendant of William I, lost the continental possessions of the Duchy to Philip II of France during that year. A few remnants of Normandy, including the Channel Islands, remained in John's possession, together with most of the Duchy of Aquitaine. The sealing of the Magna Carta in 1215 put England on course to become a constitutional monarchy. Edward I defeated Llywelyn ap Gruffudd, and so effectively conquered Wales, in 1282. He created the title Prince of Wales for his eldest son, the future Edward II, in 1301. Edward I's conquest was brutal and the subsequent repression considerable, as the magnificent Welsh castles such as Conwy, Harlech, and Caernarfon attest; but this event re-united under a single ruler the lands of Roman Britain for the first time since the establishment of the Kingdom of the Jutes in Kent in the 5th century AD, some 700 years before. Accordingly, this was a highly significant moment in the history of medieval England, as it re-established links with the pre-Saxon past. These links were exploited for political purposes to unite the peoples of the kingdom, including the Anglo-Normans, by popularising Welsh legends. The Welsh language—derived from the British language, with significant Latin influences—continued to be spoken by the majority of the population of Wales for at least another 500 years, and is still a majority language in parts of the country. Edward III was the first English king to have a claim to the throne of France. Edward III pursued this claim, which resulted in the Hundred Years' War (1337–1453). The war pitted five kings of England of the House of Plantagenet against five kings of France of the Capetian House of Valois. Though the English won numerous victories, they were unable to overcome the numerical superiority of the French and their strategic use of gunpowder weapons. 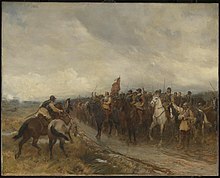 England was defeated at the Battle of Formigny in 1450 and finally at the Battle of Castillon in 1453, retaining only a single town in France, Calais. During the Hundred Years' War an English identity began to develop in place of the previous division between the Norman lords and their Anglo-Saxon subjects, in consequence of sustained hostility to the increasingly nationalist French, whose kings and other leaders (notably the charismatic Joan of Arc) used a developing sense of French identity to help draw people to their cause. The Anglo-Normans became separate from their cousins who held lands mainly in France, who mocked the former for their archaic and bastardised spoken French. English also became the language of the law courts during this period. Wales had retained a separate legal and administrative system, which had been established by Edward I in the late 13th century. The country was divided between the Marcher Lords owing feudal allegiance to the crown and the Principality of Wales. Under the Tudor monarchy, Henry VIII replaced the laws of Wales with those of England (under the Laws in Wales Acts 1535–1542). Wales now was incorporated into the Kingdom of England, and henceforth was represented in the Parliament of England. During the 1530s, Henry VIII overthrew the power of the Roman Catholic Church within the kingdom, replacing the pope as head of the English church and seizing the church's lands, thereby facilitating the creation of a new Protestant religion. This had the effect of aligning England with Scotland, which also gradually adopted a Protestant religion, whereas the most important continental powers, France and Spain, remained Roman Catholic. Calais, the last remaining continental possession of the Kingdom, was lost in 1558, during the reign of Philip and Mary I. Their successor, Elizabeth I, consolidated the new Protestant Church of England. She also began to build up the Kingdom's naval strength, on the foundations Henry VIII had laid down. 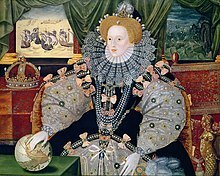 In 1588, her new navy was strong enough to defeat the Spanish Armada, which had sought to invade England in order to put a Catholic monarch on the throne in her place. In April 1653 Cromwell and the other Grandees of the New Model Army, frustrated with the members of the Rump Parliament who would not pass legislation to dissolve the Rump and to allow a new more representative parliament to be elected, stopped the Rumps session by force of arms and declared the Rump dissolved. Richard proved to ineffectual and unable to maintain his rule. He resigned his title and retired into obscurity. The Rump Parliament was recalled and there was a second period where the executive power lay with the Council of state. 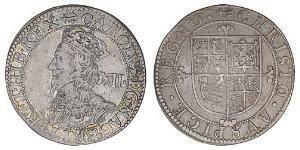 But this restoration of Commonwealth rule similar to that before the Protectorate, proved to be unstable, the exiled claimant, Charles II, was restored to the throne in 1660. A Treaty of Union was agreed on 22 July 1706, and following the Acts of Union of 1707, which created the Kingdom of Great Britain, the independence of the kingdoms of England and Scotland came to an end on 1 May 1707. The Acts of Union created a customs union and monetary union and provided that any "laws and statutes" that were "contrary to or inconsistent with the terms" of the Acts would "cease and become void." Unlike the partly self-governing boroughs that covered urban areas, the counties of medieval England existed primarily as a means of enforcing central government power, enabling monarchs to exercise control over local areas through their chosen representatives – originally Sheriffs and later the Lord Lieutenants – and their subordinate Justices of the Peace. Counties were used initially for the administration of justice, collection of taxes and organisation of the military, and later for local government and electing parliamentary representation. The power of the feudal barons to control their landholding was considerably weakened in 1290 by the statute of Quia Emptores. Feudal baronies became perhaps obsolete (but not extinct) on the abolition of feudal tenure during the Civil War, as confirmed by the Tenures Abolition Act 1660 passed under the Restoration which took away Knights service and other legal rights. Tenure by knight-service was abolished and discharged and the lands covered by such tenures, including once-feudal baronies, were henceforth held by socage (i.e. in exchange for monetary rents). The English Fitzwalter Case in 1670 ruled that barony by tenure had been discontinued for many years and any claims to a peerage on such basis, meaning a right to sit in the House of Lords, were not to be revived, nor any right of succession based on them. The Statute of Rhuddlan in 1284 followed the conquest of Wales by Edward I of England. It assumed the lands held by the Princes of Gwynedd under the title "Prince of Wales" as legally part of the lands of England, and established shire counties on the English model over those areas. The Marcher Lords were progressively tied to the English kings by the grants of lands and lordships in England. The Council of Wales and the Marches, administered from Ludlow Castle, was initially established in 1472 by Edward IV of England to govern the lands held under the Principality of Wales. Under the Laws in Wales Acts 1535–1542 introduced under Henry VIII, the jurisdiction of the marcher lords was abolished in 1536. The Acts had the effect of annexing Wales to England and creating a single state and legal jurisdiction, commonly referred to as England and Wales. ^ Widely used for administrative and liturgical purposes. Medieval Latin replaced by Renaissance Latin by 15th century. ^ The Constitution of the United Kingdom, with the reservation that it is "uncodified". is taken to be based in the Bill of Rights 1689. ^ London, 800-1216: The Shaping of a City, "...rivalry between City and government, between a commercial capital in the City and the political capital of quite a different empire in Westminster. ", accessed November 2013. ^ Youngs, Frederic A, Jr. (1979). Guide to the Local Administrative Units of England, Vol.I: Southern England. London: Royal Historical Society. pp. xii–xiii. ISBN 0-901050-67-9. Ancient County: Counties are geographic entities whose origins reach back into the pre-Conquest period. They were derived either from Anglo-Saxon kingdoms whose size made them suitable administrative units when England was unified in the tenth century, or as artificial creations formed from larger kingdoms. The number of 'shires' (the Anglo-Saxon term) or 'counties' (Norman term) varied in the medieval period, particularly in the north of England. ^ Chandler, J. A. (2007). "Local government before 1832". Explaining Local Government: Local Government in Britain Since 1800. Manchester: Manchester University Press. p. 2. ISBN 0719067065. ^ Hackwood, Frederick William (1920). The Story of the Shire, being the Lore, History and Evolution of English County Institutions. London: Heath Cranton Limited. ^ Byrne, Tony (1994). Local Government in Britain. Harmondsworth: Penguin Books. ISBN 0-14-017663-2. ^ Winchester, Angus J L (1990). Discovering Parish Boundaries. Oxford: Shire Publications. ISBN 0-7478-0060-X.